We are so used to seeing pastel colours in Miami South Beach that it is nice to see some a primary colour. On this apartment building in Euclid Avenue it is a red roofline, framing around the windows and the entrance. I think the red colour fits very well with this particular building because it is different in style to many Miami buildings. Simplier and modernist in style with a large expanse of raw brick. 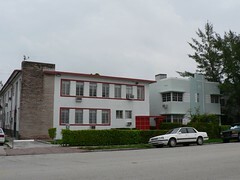 And next door for comparison we have a more typical Miami apartment block painted in typical Miami shades.